In 1838, the Cherokee People were forcibly and illegally removed from their homelands in the southeast United States and resettled in northeastern Oklahoma. Some remained in the original lands (either by returning or hiding during the round up). Brenda Mallory (Cherokee Nation) and Luzene Hill (Eastern Band Cherokee) are members of these two bands who met during their 2015 Eiteljorg Fellowship. Their work will be featured together in the fourth exhibition in the Portland Art Museum’s Center for Contemporary Native Art, opening in March 2017. Luzene Hill’s work included in this exhibition will focus on issues of violence against Native women, female empowerment, and native sovereignty—topics that Hill has addressed in her past work. Through a series of new works, she is merging her interest in the history and materiality of cochineal dye with the epidemic of sexual violence against Native women. Cochineal dye is a natural red dye developed from the carminic acid that is produced by a specific type of adult female insect in order to protect itself from predators. The dye has beenused in Central America for coloring fabrics yet was taken from and hoarded by the Spanish from the Mixtecs and others. Her large-scale hanging work of dyed silk and figural forms will also connect with the number 6956, which is the average number of Native women who report being sexually assaulted each year (and it’s important to note that only about 16% of sexual assaults are ever reported). 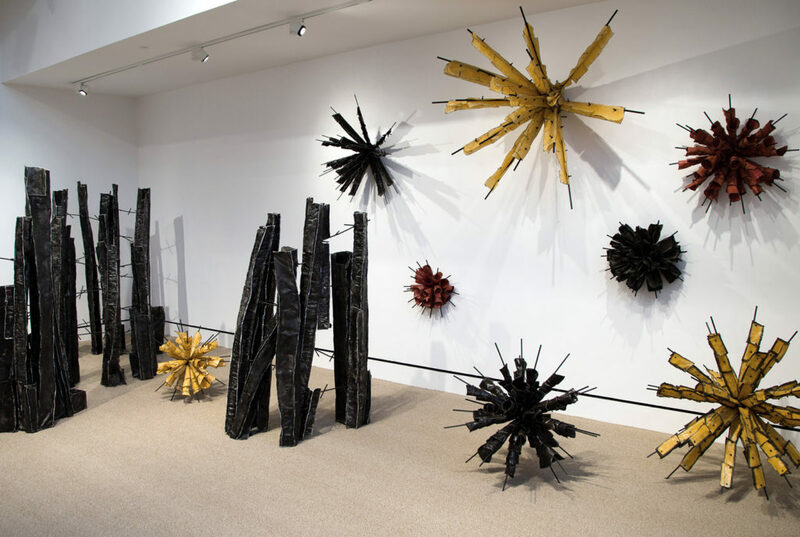 Created during her Eiteljorg Contemporary Art Fellowship in 2015, Brenda Mallory’s installation entitled Recurring Chapters in the Book of Inevitable Outcomes consists of tall shapes resembling charred timbers or skeletal plant stalks surrounded by colorful, lively spore-like forms. The ruin-like floor pieces speak to what was left behind, but the resilience and hope shows in the spore-like forms that scatter across the walls and floor like blowing seeds. Her work is inspired by a rereading of Cherokee history, and addresses ideas of disruption, repair, and renewal. Brenda Mallory (Cherokee Nation) is a Portland-based artist whose work ranges from individual wall-hangings and sculptures to large-scale installations. She works with mixed media, mining natural and found materials to create multiple forms that are joined with crude hardware or mechanical devices to imply tenuous connections and aberration. She is interested in ideas of interference and disruptions in systems of nature and human cultures. A resident of Portland for many years, Mallory grew up in Oklahoma and is a member of the Cherokee Nation. She has a BA in Linguistics & English from UCLA and a BFA from Pacific Northwest College of Art. Mallory has received awards from the Oregon Arts Commission, Ford Family Foundation, and Regional Arts & Culture Council and Crow’s Shadows Institute of Art. She was a 2015 Eiteljorg Contemporary Native Artist Fellow, was awarded a 2016 Native Arts and Culture Foundation Fellow in Visual Arts, and is a Mentor in the MFA Applied Craft and Design Program at PNCA+OCAC. Luzene Hill (Eastern Band Cherokee) is a multi-media artist, best known for conceptual installations addressing the issue of violence against women. Her work reflects interdisciplinary scholarship in visual art, women’s studies, Native American culture – topics that are integral to her background and personal journey. Through work informed by Pre-Contact culture Hill advocates for indigenous sovereignty – linguistic, cultural and personal sovereignty. 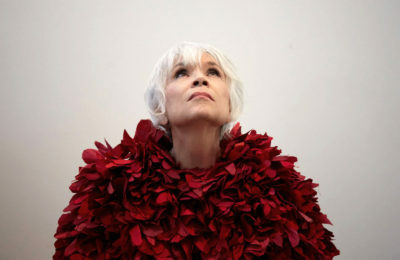 These concepts form the basis for her installations, performance, drawings and artist’s books. An enrolled member of the Eastern Band of Cherokee Indians Hill lives and works in Atlanta, Georgia. Her awards include the 2016 Native Arts and Cultures Foundation Fellowship in Visual Arts, the 2015 Eiteljorg Museum Fellowship and 2015 First Peoples Fund Fellowship. Hill’s work is featured in Susan Powers’ book, “Cherokee Art: Prehistory to Present” and in Josh McPhee’s book, “Celebrate People’s History! : The Poster Book of Resistance and Revolution”. The Museum’s Center for Contemporary Native Art is a dedicated gallery for presenting the work and perspectives of contemporary Native artists. After its opening in Fall 2015, the Center will host two rotating exhibitions each year and feature a range of related programming. At the core of this Center’s mission is the Museum’s commitment to partner with Native artists in co-creating the exhibitions, interpretation, and programming for the space. The Center’s exhibitions parallel the institution’s larger curatorial vision of intentionally bridging the past and present through integrating more contemporary artwork into the Native American galleries. This approach allows visitors to take away a greater understanding of Native peoples as not only still living but as sophisticated, dynamic, and changing. 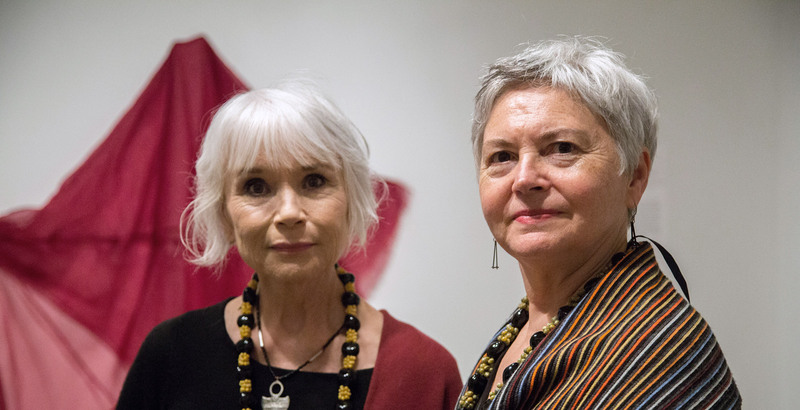 The Center for Contemporary Native Art is supported by the Institute of Museum and Library Services and generous gifts from Mr. Mark J. and Dr. Jennifer Miller, Taffy Gould, Anonymous, and Exhibition Series Funders.